Bleakhouse is a new Rails plugin by Evan Weaver that helps you find memory leaks in your Rails applications. 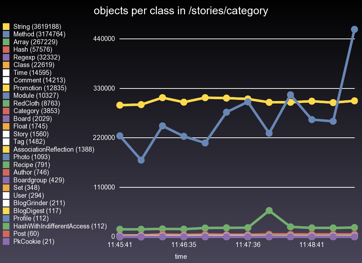 It does this by hammering ObjectSpace for information throughout the execution of your app and by producing pretty charts to show you what's going on. It's easy to install and get running, so if memory leaks or application stability have proven to be sore points for you, give it a try straight away. I'm still wondering if there's a graphical _profiler_ available for Rails/Ruby, and Evan has come up with a memory leak hunter? Thanks, I'm running a Ruby app under MediaTemple using the GridServers. So far ok, but needed to boost the memory a bit. They say they're working on the memory leak inside Ruby Containers, trust them, just seems this is a common problem with this language. But then it is still pretty new.